See this post on BuzzFeed too! 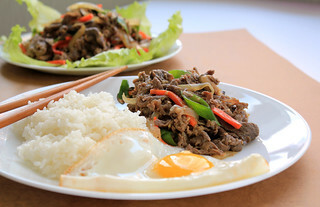 Korean BBQ such as bul gogi (bul go gi, bulgogi etc…) is a super easy sweet and salty marinade that anyone can do, and it tastes ridiculously good. My family favorite recipe is below, so please indulge and let me know what you think in the comments! 2 lbs round roast (beef), sliced very thin (sandwich meat thin, around 1/16th – 1/8th an inch), have the meat guy/gal do this for you. Better beef works as well. Asian markets often have beef pre-sliced, which will make it a bit easier. A dash of salt — the soy sauce is already salty, so not a required ingredient. Ready a container that will fit your beef and some extra liquid from the marinade. I typically will use a Pyrex container, since glass does not hold on to smells like plastic. A gallon (or two) ziplock bag will work too, just make sure to stand it up in the fridge so it doesn’t spill everywhere. Chop up onion and garlic (no need for perfect chopping, it’s just for the marinade!). Mix in Coca-Cola, soy sauce, brown sugar, pepper, sesame oil and salt. Place your sliced up beef in the marinade, and place in fridge overnight, or for several hours (all day at the least — 12+ hours preferable). Grill meat for a short period, it does not take long to grill the thinly sliced beef. Broiling will also work. Personally, I prefer a nice char on at least part of the meat since that char just tastes so good. Serve alone (meat is meat! ), or with white or brown rice and some Korean seaweed (dried, salted and oiled seaweed) and enjoy. I typically will buy a jar of kimchi to serve as a side, along with some in-season fruit to balance all that greasy (tasty) meat, but that is of course all up to you.